Next Year Country: Federal NDP meets in Montréal – another missed opportunity? Federal NDP meets in Montréal – another missed opportunity? The federal convention of the New Democratic Party, the Official Opposition in Canada’s parliament, opens on Friday, April 12, in Montréal. page book of resolutions proposed by constituency associations, affiliated trade unions and party leadership bodies contains very little addressed to the national question. This is unfortunate, as there is much the party members need to discuss — ranging from a new look at its existing position on the Quebec national question (the “Sherbrooke Declaration”) to Mulcair’s stated support for building a Quebec “provincial” NDP that would compete electorally with the pro-independence Quebec solidaire. The Sherbrooke Declaration is now published as an appendix to the NDP program. The party’s small Socialist Caucus, which exists mainly in the Toronto region, has sponsored noon-hour public meetings at the convention on the Friday and Saturday. The first, on “Quebec and the NDP” and “Why Quebec Students are in the Streets Again,” features speakers André Frappier, a co-leader of Québec solidaire, and Adam Szymanski, a Quebec student active in the recent student strike. The second meeting, on Canada’s military intervention in Asia, Africa and the Caribbean, features Raymond Legault, a leader of the antiwar coalition “Échec à la guerre,” and Caucus chairperson Barry Weisleder. The Caucus has produced an issue of its occasional magazine Turn Left for distribution to the convention delegates. It is also available for download athttp://www.ndpsocialists.ca/. The magazine includes two articles by yours truly, one in English, the other in French, which I wrote at the request of the Caucus. Both are addressed to the NDP’s position on the Quebec national question, and in particular the federal party’s recent bill to reform the controversial Clarity Act. I am not responsible for the content of other articles in Turn Left. Only one draft resolution submitted to this convention addresses the NDP bill; Malpeque constituency (in Prince Edward Island) challenges the “50% plus 1” test for determining the validity and legitimacy of a Quebec referendum vote for sovereignty. Other resolutions urge greater party support for English-French bilingualism in federal institutions like the Supreme Court and the CRTC, the federal broadcast control agency, and some terminological changes to reflect binational differences, such as changing “national director” in the party statutes to “federal secretary.” One, submitted by “Young New Democrats of Quebec,” advocates replacing the party’s support for “multiculturalism” with “inter-culturalism,” but without explaining the differences between the two, which are correctly viewed as significant in Quebec. The original draft of my English article had to be shortened, with my agreement, for Turn Left, owing to space limitations. It is published in full below. The French article, also published below, is an adaptation for a Québécois audience of my blog piece “The NDP Revisits the Clarity Act,” and was translated by Pierre Beaudet. As regular readers of this blog are aware, I am a harsh critic of the NDP’s record on Quebec, and of the Sherbrooke Declaration. The first article, below, sidesteps some of these aspects and attempts to emphasize for NDP members the overriding need for the party to hold a serious discussion at all levels, but particularly in English Canada, on how the Quebec question fits within the development of a strategy for progressive change in what is currently the Canadian state. The NDP’s bill C-470, which would replace the Clarity Act and acknowledge the democratic legitimacy of a simple majority vote for sovereignty in a Quebec referendum, aroused a storm of opposition. Not just from the other federalist parties (which was to be expected), but also from the major media in English Canada. More ominous was a Harris-Decima-Canadian Press poll in early February that found majority support for the bill only in Quebec, while in English Canada close to three out of four respondents were opposed. And a CP poll of provincial NDP leaders found that only one, New Brunswick’s Dominic Cardy, was willing to express support for it. The others, including the premiers of Nova Scotia and Manitoba, refused to comment. Yet Bill C-470 simply applies the reasoning in the NDP’s Sherbrooke Declaration, adopted overwhelmingly by the federal party in 2006 as its current position on the “Quebec question.” The Declaration recognizes “Quebec’s right to self-determination,” which, it says, “implies the right of the people of Quebec to decide freely its own political and constitutional future.” If Quebec were to hold a vote on sovereignty “the NDP would recognize a majority decision (50% + 1)….” The Declaration was widely credited as a factor in the “orange wave” that elected NDP candidates in 59 of Quebec’s 75 electoral districts in 2011, hoisting the party to Official Opposition status in the House of Commons. What does the reaction to Bill C-470 tell us about the challenge facing the NDP and its attempts to reconcile Quebec’s desire for change in its status as a nation with the party’s longstanding support of Canada’s federal system? The Sherbrooke Declaration’s principled recognition of Quebec’s right to national self-determination — notwithstanding some ambiguities and contradictions, discussed below — represented an important step forward for the NDP, which since its founding in 1961 has struggled to understand Québécois dissatisfaction with Canada’s federal regime. The party’s firm commitment to working within the existing constitutional framework of the Canadian state has often collided with the pro-sovereignty views held by the trade unions and most progressives in Quebec. In the early 1960s, the majority of NDP supporters in Quebec split to form an independent party, the Parti socialiste du Québec (PSQ), which called for adoption of a sovereign Quebec constitution and the negotiation of a new “confederal” accord with English Canada. The PSQ was soon eclipsed, however, by the formation of the Parti québécois, which expressed a similar objective of sovereignty followed by some form of constitutional association with English Canada. Caught short by the rise of the independence movement, the federal NDP tended to tail the approach to constitutional reform taken by Pierre Trudeau and the federal Liberals as well as the Conservatives. It was an active participant in the unilateral 1982 patriation of the Constitution, which now included a Charter of Rights that would be used by the Supreme Court of Canada to void major provisions of Quebec legislation protecting French-language rights. Successive Quebec governments — sovereigntist and federalist alike — have never accepted the legitimacy of that Constitution. 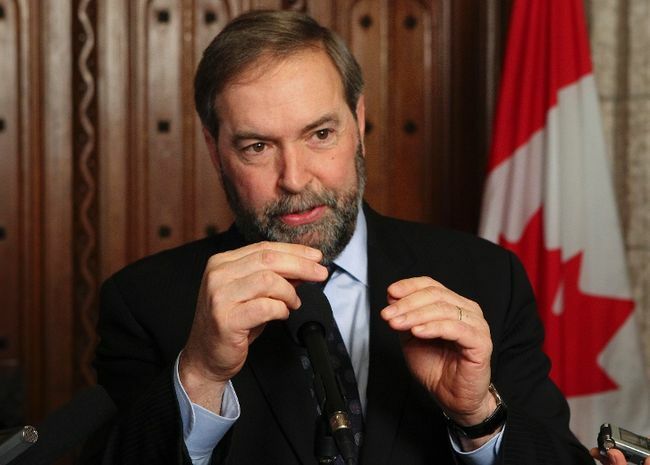 The federal NDP campaigned for the No side in both of Quebec’s referendums on sovereignty, in 1980 and 1995. And in 2000 the party’s parliamentary caucus — defying opposition by the NDP Federal Council and the Canadian Labour Congress — voted for the governing Liberals’ Clarity Bill, which makes Quebec sovereignty following a successful “yes” vote contingent on acceptance by the federal Parliament of both the question asked and the response given by the voters. These actions effectively foreclosed any possibility of building significant support for the party in Quebec. Unable to build an enduring base of support in the province, the NDP for decades lacked credibility in both Quebec and the Rest of Canada as a potential federal government. By the turn of the century, it was evident that no one on the federalist side could credibly promise renewed federalism. However, a Social Democratic Forum on Canada’s Future, sponsored by the party in the late 1990s, came up with a host of proposals for a change in the relationship between English Canada and Quebec, many of them later incorporated in the Sherbrooke Declaration. The adoption of the Declaration signalled a new readiness to rethink the party’s relationship to Quebec. And in 2011, this openness was sufficient to convince many Quebec voters, now looking for potential allies in English Canada in resisting a Harper majority government, to turn to the NDP. Despite its new recognition of Quebec’s right to national self-determination, the Sherbrooke Declaration does not reject a federal role in determining the legitimacy of a Quebec vote for sovereignty, nor does Bill C-470. The bill simply attempts to structure that role, in effect fettering the power of the federal Parliament to reject the popular verdict. It would accept a narrow Yes victory — and suggests some acceptable wording of the question — while proposing a similar procedure for a possible Quebec referendum question on reforming the Constitution short of secession. Both Tories and Liberals had hoped that the amending formula in Trudeau Senior’s 1982 Constitution — which makes any major constitutional change contingent on adoption by Parliament and seven of the ten provinces with at least 50% of Canada’s population — would rule out any possibility for Quebec’s legal secession from the federation. They are outraged that the NDP, with its modest proposal to accept a democratic majority vote, has now challenged this federalist consensus. We can be sure that they will hound the party on this issue in the months and years to come. The Sherbrooke Declaration indirectly acknowledges the impossibility of constitutional reform to accommodate Quebec concerns. Instead, it recommends a limited practice of “asymmetrical federalism” that would “consolidate [conjuguer] the Canadian federal state with the reality of Quebec’s national character” by allowing Quebec to opt out with compensation from federal programs in areas of exclusive provincial jurisdiction. And its over-arching concept of “cooperative federalism,” an old NDP standby, involves not a reallocation of powers but a never-ending process of policy and program negotiation between Quebec and Ottawa and (in most cases) the other provinces and territories, negotiations in which Quebec may and often does find itself alone arrayed against the other ten or more governments. It is cast as a strategy for winning Quebec acceptance of a federal union even before any constitutional guarantees of its national character have been achieved. Fundamentally, this comes down to little more than the status quo. Clearly, the ball is in the court of the Québécois to initiate and lead the movement for change in Quebec’s constitutional status, whether in or out of the federation. But is the NDP prepared not only to listen to this national movement and learn from it, but to work to create understanding and solidarity with the national struggle of the Québécois among its members and supporters in English Canada? Such solidarity is an essential ingredient in building a pan-Canadian movement that can not only defeat the Harper government but reverse the neoliberal offensive. This requires a much greater effort by the party in English Canada to address Québécois concerns — a major challenge, as English Canadian hostility to even the modest democratic content of the NDP’s Bill C-470 illustrates. The Sherbrooke Declaration was adopted at a time when the pro-sovereignty movement was at an ebb, largely as a result of popular frustration in Quebec at the lack of success in previous attempts at constitutional reform as well as disillusionment with the neoliberal “zero deficit” record of Parti québécois governments. This may have given some credibility to the Declaration’s argument that Quebec’s aspirations could be satisfied without a change in its constitutional status. However, popular disaffection with the Harper government in Quebec offers the prospect of renewed support for sovereignty. On September 4, 2012, Quebec voters elected a PQ government, 40% of them casting their ballots for the PQ and other pro-sovereignty parties. The defeat of Québec’s Liberal government was in part the result of the “Printemps érable,” the Maple Spring of 2012, which began with a massive strike by college and university students that eventually drew tens of thousands of other citizens into the streets in solidarity with the students and opposition to government repression. The students’ call for fundamentally rethinking the role of education in Quebec society and questioning the whole logic of neoliberal commodification of social services won the sympathy of many Québécois. The scope of this mass democratic struggle, and the profound social issues it has raised, have inspired many to think about how “another Quebec,” a society of social justice and equality, can be built as an alternative to the neoliberal regression of today. Their debates can inspire equivalent thinking and responses among other victims of the capitalist offensive across Canada. 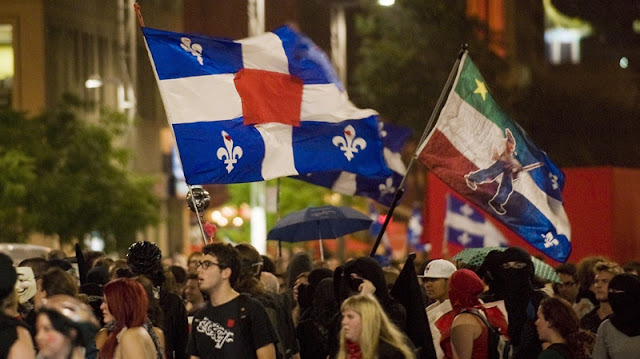 Quebec sovereigntists are now attempting to refound the movement for independence in a series of meetings throughout the province under the aegis of the Estates General, a broad coalition of parties and other organizations. A pamphlet to introduce the debates, entitled (in English translation) “What Future: A Province, or a Country?,” lists no fewer than 92 “obstacles” to Quebec’s development under the federal regime, as perceived by its authors. Many point to what are undeniably fundamental problems with the Canadian federation. “Today, in all parts of Quebec a movement is rising that resists cynicism and disenchantment, rejects the dictates of neoliberalism in the name of democracy, and seeks to reappropriate citizens’ action and implement collective solutions. In this forward march toward the common good, these forces are rediscovering the importance of the state in realizing this objective. However, the state to which the hopes and aspirations of a large majority of Québécois turn, the State of Quebec, is a truncated, padlocked and cordoned off state because it is confined to mere “regional” and “provincial” actions within the Canadian regime…. An important progressive component of this Quebec national movement is Québec solidaire, a left-wing party founded in 2006 following a decade-long process of coalescing left-wing organizations, including the remnants of the old Quebec NDP, with activists from Quebec’s social movements, including the women’s movement and many trade unions. Québec solidaire presents its program for fundamental social change in the conceptual framework of an independent Quebec that would act in solidarity with progressive movements in Canada and around the world. QS has about 14,000 members, slightly more than the federal NDP’s membership in Quebec. NDP members and supporters outside Quebec can sympathize with the democratic and progressive thrust of this movement, even if many find it difficult to accept its sovereigntist conclusions. They have every reason to see themselves as partners in this process, and not its opponents. In fact, a powerful movement for social and political change in Quebec can only bolster all progressive forces in Canada. But it will be a struggle. Many anti-Quebec misconceptions and prejudices have to be confronted and overcome. The NDP will face unrelenting opposition in its efforts by a hostile media, especially in English Canada. However, there really is no alternative if the party is to build on its May 2011 breakthrough. And there is ample evidence that the needed reorientation of NDP thinking on Quebec, initiated by the Sherbrooke Declaration, can in coming years help to cement strong ties of solidarity between progressives in both nations — a precondition to turning politics in Canada toward the left.